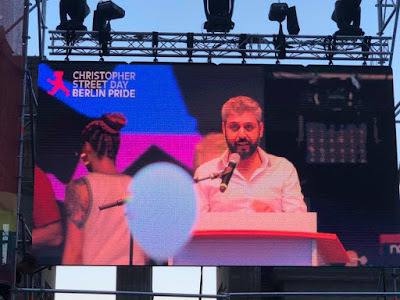 Stephan Cooper of Queer Amnesty group within the Amnesty International in Germany presented the award during a ceremony at famous Christopher Street Day (CSD) Pride event in Berlin on 28 July. 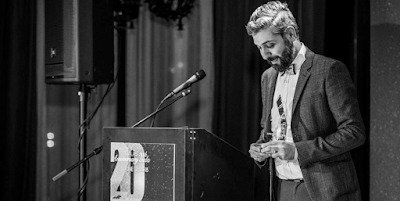 Soul of the Stonewall Award 2018 in the telling category Resistance was awarded for the fifth time, with previous recipients coming from Nigeria, Turkey, Bangladesh, and Kenya. Presenting the award to Mamikon Hovsepyan of PINK Armenia, Stephan mentioned current changes in Armenia [re: Velvet Revolution]. He touched upon history of Armenia, including 1915 Genocide, and even amusingly cited a line of the National Anthem of Armenia (Lass Armenien stehts ehrenvoll sein - Թող միշտ պանծա Հայաստան). It’s a 3rd award in less than a year that Mamikon received, starting with the Bob Hepple Equality Award 2017 in London. As Stephan mentioned, for more than a decade Mamikon has been active in the field of human rights – fighting for free and equal Armenia. 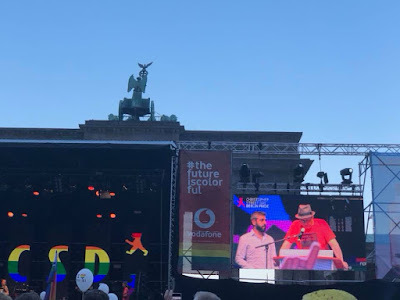 Intolerance, lack of justice, families not accepting their LGBT children, homophobic speeches from members of the parliament and representatives of the mayor office - these are just a few examples of what LGBT Armenians routinely face in their daily life, as noted during presentation of the award. 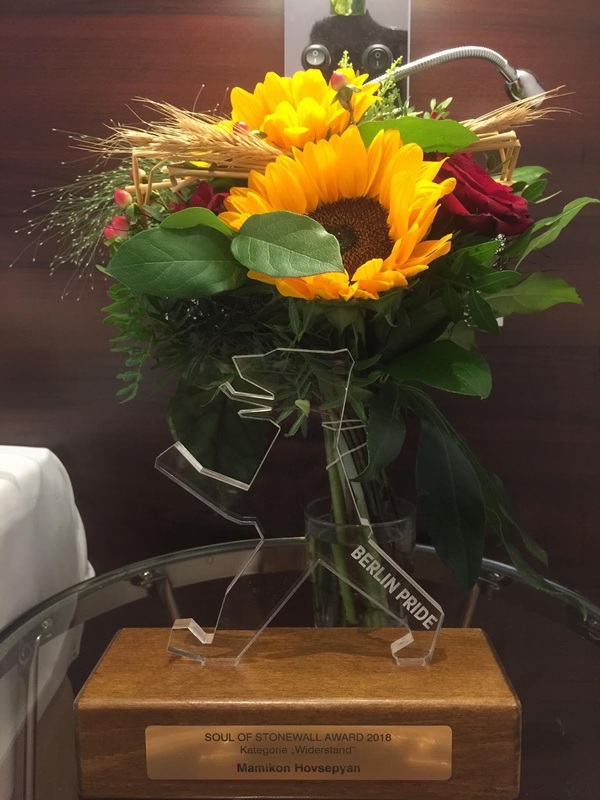 You can see event and Mamikon’s acceptance speech on this video starting around 1:47:00. As per Stephan, back in 2002 Mamikon went to USA with the initial intention to stay there. But he changed his mind and returned to Armenia with the understanding that he can change his own country only if he himself participates in this change. No wonder a month ago in LA he received a Changemaker award by the most prominent Armenian Diaspora LGBT group - Gay and Lesbian Armenian Society (GALAS), that marks its 20th anniversary this year. Over 180 guests gathered for the (GALAS) 20th anniversary on June 2nd in Glendale, California. 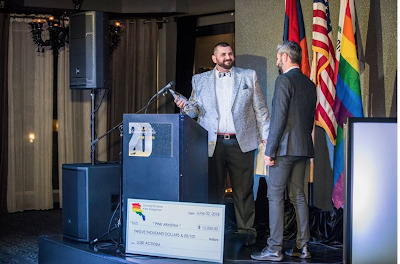 Members of Armenian LGBTQ community were surrounded by friends and family for a special, intimate evening marking two decades of empowering LGBTQ individuals of Armenian descent. Gevorg Khudyan, member of GALAS, presented the Changemaker Award, and along with his husband Karo Margaryan also donated 12K USD to PINK Armenia for organisation’s office rent and utilities. In all his acceptance speeches, Mamikon repeatedly states that Armenia has a potential to be one of the best countries where human rights are protected. This is especially true after the Velvet Revolution of April-May 2018, also known as a Revolution of Love and Solidarity. 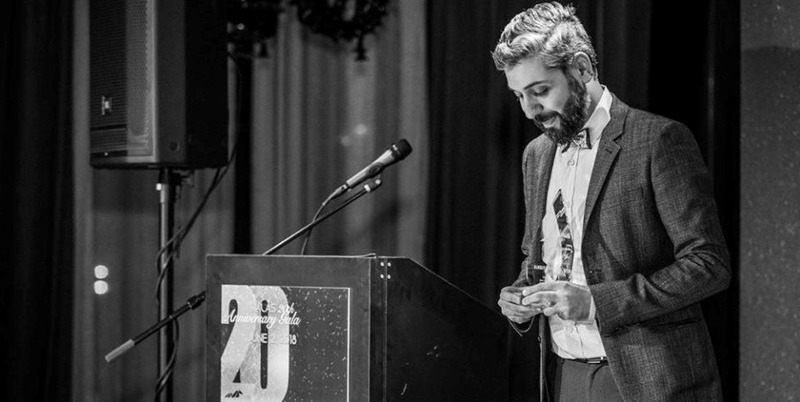 I am so happy and proud that finally Armenian LGBT activists getting international recognition they deserved. Of course, as frequently the case, such formal recognition comes from the outside of their home country. Here is hoping that eventually the Velvet Revolution, that happened in Armenia with the active participation of LGBT Armenians too, will fully recognise and respect the rights of its citizens. 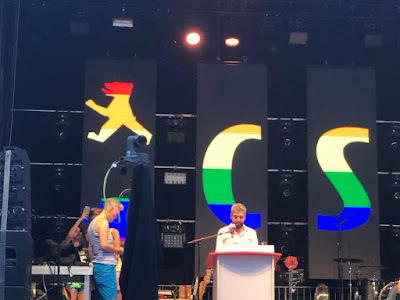 And I am not referring here to medals or awards, but the concept of human rights for all, that was pledged by prime minister Nikol Pashinyan.